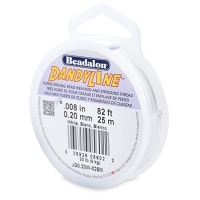 Get FREE Shipping on all DandyLine Bead Cord today. 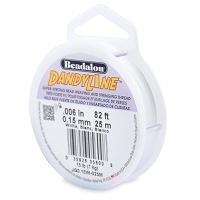 DandyLine Cord is a braided cord that provides maximum strength and flexibility for any Bead Stringing and Bead Weaving project. It is made using an advanced synthetic material, called Spectra, that provides extreme softness, and flexibility. This cord is extremely strong, and is soft, like Silk. 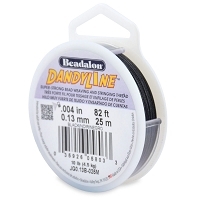 DandyLine Cord is 100% waterproof and will not stretch. 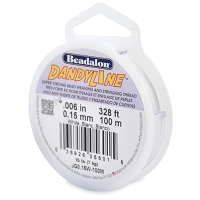 Use hard beading needles for smaller diameters and collapsible eye needles for larger diameters. 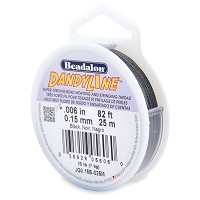 Because of it's dramatic strength, DandyLine Cord is recommended for use on Diamond Beads, and Swarovski Crystals. Made in the USA. 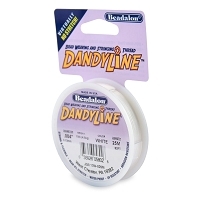 DandyLine is an ultra-strong bead thread for bead weaving and bead stitching jewelry designs. 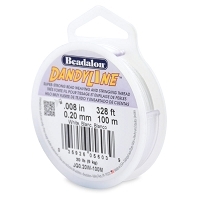 This thread is ultra strong and ultra soft like Silk.